Are you ready to hit the road as a confident, safe driver? Why take a driver education course? To apply for and receive a Restricted Permit in Kansas at age 15, the student must have successfully completed and passed a driver education program (classroom and drive time). Instruction includes reviewing the law manual, handling emergency situations, vehicle maintenance, vehicle controls, planning a trip, operating a vehicle on the roadways, parking, how to obtain a license or permit and the responsibilities of owning a vehicle. Four to six lessons behind the wheel with a certified instructor based on student's ability to pass the competencies for each lesson. Some insurance companies give a discount to students/families that have completed a driver education program. Students must be at least 14 years old. It is recommended that a student have an instructional permit prior to class, but it is NOT necessary. We recommend that students experience behind-the-wheel driving with a parent/adult prior to the first driving lesson. Students should be able to start and stop a vehicle and make left- and right-hand turns in a residential setting. Why choose JCCC Continuing Education? Students will have the same state-certified instructor for all classroom and behind-the-wheel training. New sessions start every few weeks. Students can complete their classroom training in only one-day. Most students complete the behind-the-wheel training in under six weeks, no drive-time wait lists! 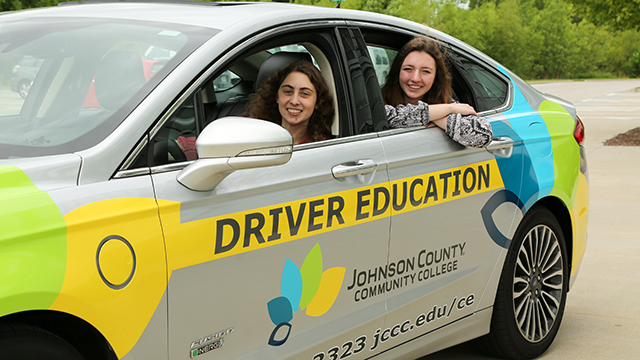 JCCC also offers driver training beyond driver education. Check out our defensive driving courses. Affected by the closure of Harder Driving School?